Products that are engineered to help you work better and be more efficient put money back in your pocket. Ranger Design electrician van shelving is designed to help you do just that. A well-organized electrician van setup will help you save time, prevent injury and allow you to carry more cargo. 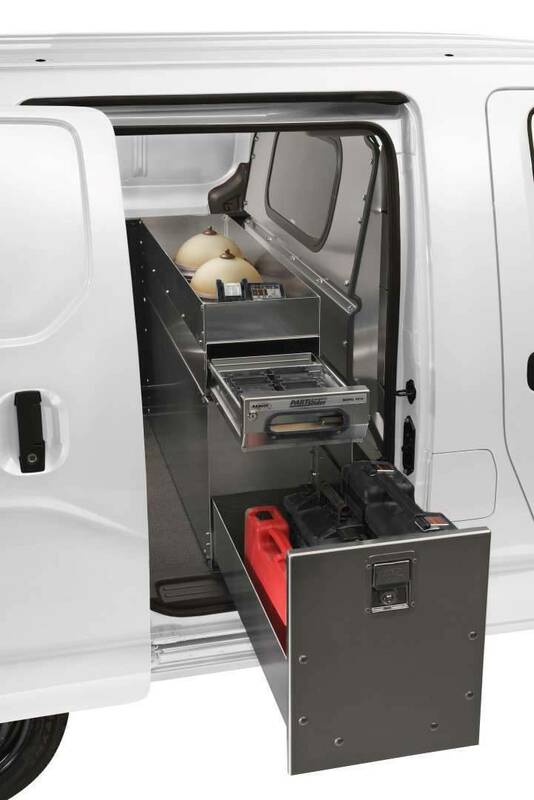 Our electrician van shelving and storage bin packages are designed with ergonomics in mind to ensure greater efficiency and to maximize your cargo van’s space. With a mix of large and small storage areas, your every tool is easily accessible and safely stowed. Electrician van shelving and storage bin packages are engineered to save weight, while still being tradesman proven tough enough to stand up to everyday wear and tear. Your electrician van is your office and you need it to be comfortable and safe. Van partitions (or bulkhead partitions) can greatly improve the comfort of your cargo van by giving you better climate control and reducing noise. Our contoured van partitions allow for maximum seat travel and increased safety by putting up a strong, protective barrier between the occupants and the cargo area. All electricians need a good ladder rack. Ranger Design has a combination Ladder Rack that’s designed to allow you to carry both a step and an extension ladder as well as a transport tube for materials. Do you have a high-roofed cargo van that makes loading and unloading a ladder a real challenge? Then check out our latest ladder rack the MaxRack drop down ladder rack. Every electrician has preferences that help them work and organize with maximum efficiency. Customizing your electrician van is all about choosing the details that work for you. That’s why Ranger Design has a full line of van accessories that provides the finishing touch that makes the difference. Check out our wide range of options, that lets you choose what works best. You’ll have everything where you need it, when you need it. There’s no denying it. Quiet products produce a more comfortable and stress free ride. Ranger Design commercial van equipment is quiet, because it’s engineered to eliminate annoying rattles. The unique design enables us to offer you an industry leading, no hassle guarantee. This means that not only does the product perform quietly when it’s new, but will continue to do so year after year. To make it easier, we’ve created electrician specific packages for each vehicle to ensure your cargo van is in service as quick as possible. Need it fast? All Ranger Design commercial cargo van packages are on QuickShip. With industry leading turnarounds, all QuickShip packages ship the next business day if they are ordered before 1:00 PM on our QuickShip website. Ranger dealers log in here.